Scent-sational Scoop... See the Light (Candle Give Away) !!! King Cake Ice Cream ...check. King Cake Scented Candle ...check. Who doesn't love all things King Cake? On a recent trip to Little Miss Muffin, I noticed a table vignette of lovely earth-friendly recycled packages containing great smelling candles named See the Light by Fleur de Light Candles. I could not resist the King Cake scented offering of this fine line. How timely! I was intrigued by the aroma of this candle--- cinnamon-based but not overpowering and a vanilla scented throw similar to the yummy icing of delicious king cakes. Have I whet your appetite? The scent captures the king cake perfectly. How can you not appreciate this concept? Buy one candle and feed a family of four. I am sold. I cannot wait to discover the other delicious scents of this fine candle line---Fig, French Market, Lavender, and many more! "Like" Fleur de Light candles on Facebook today! Now for the King Cake Candle Give Away.... Here are the rules! You must follow the rules to be eligible for the drawing later this week. I'm a newcomer to your blog but it quickly gained a spot on my morning reading list--love your 'tours' and decor (and the oyster plates!) ! Welcome Deb! Glad to have you. Do not forget to follow by Linky!!! See my left margin! Pick me! Pick me! I need a little king cake in the house. Can it make it all the way to Germany? I need some King Cake in my life. This cajun girl who now lives on the Northshore would love a King Cake Candle!! I am following you at Linky followers and I follow your blog! 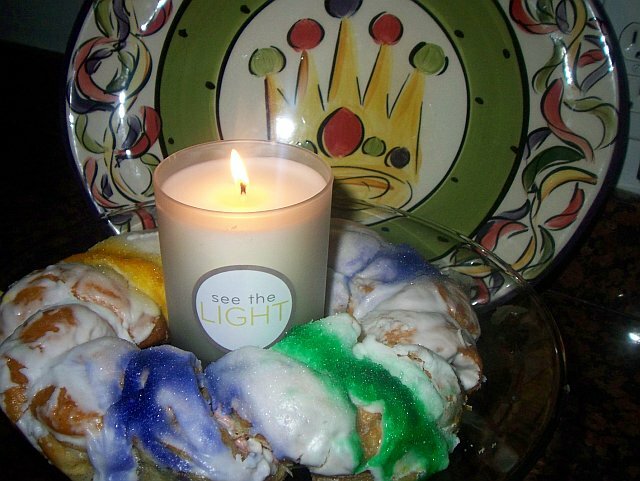 What a great scent idea ~ king cake! I would love one! I love giveaways! Your blog is "scentsational"! I love king cake, candles, and reading your blog! Happy Mardi Gras! Pick me Ron! Pick me! Honey would tell you to do so! Me!!! Pick me, I'm having a Mardi Gras party this weekend and need this candle!! Love your blogs, Ron! I have lived in Thibodaux my whole life and you have opened up my eyes to wonderful hometown businesses I've never visited! 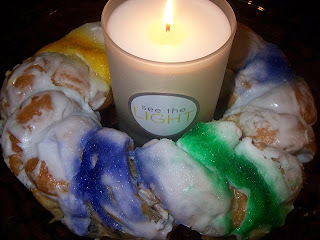 Love the blog and would love a King Cake Candle! HibRon. Enjoy your blog. Hope u enjoy Mardi GRAS. Miss our usual place to watch the parades. What a super fun blog! 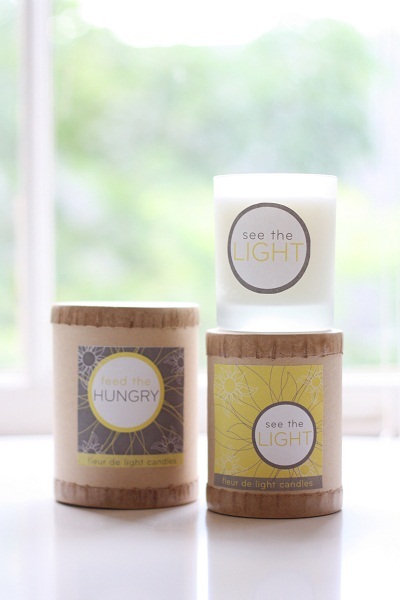 Just ordered some See the Light candles and I really hope to win one too! I'd love a King Cake Candle... That smell reminds me of my father's roots growing up outside of Biloxi! Happy Mardi Gras, Ron! I would love to win your candle give away. I just have to get permission from my fireman husband it burn it! Yay! I just followed you on blogspot and linky. Hope I win that candle! Yay! This candle sounds fabulous. I am following you on Linky and blogspot! Sondra Berger founded the candle company in 2006 as a"love letter to her hometown of New Orleans." The candles use 100% cotton wicks to reduce soot and carbon. I was further intrigued when I discovered that through the sales of See the Light candles in cooperation with the Second Harvest Food Banks of Greater New Orleans and Acadiana, over 19,000 people have been fed since August 2011.